It is no secret that one of my favorite hobbies is couponing. I love to shop, but I have always loved to shop for a deal. With couponing, I get my shopping fix and spend little to nothing, and usually have “money” to go toward the next week’s shopping trip. When I know a product can be bought for less at another store, I will put it down and wait. I have been known on (most) Sundays to spend 3-4 hours shopping for freebies and finish up with a great deal at the local grocery store. To me, that’s the best way to spend my money! Does that mean we live frugal? Well, I question that. One day I was cleaning up my pump and looked at the accessory wipe. It is far too large, and they really should be cut in half. But, that’s the way the companies make their money. I seriously considered pulling every wipe out of the package and cutting them. Then I snapped out of it. There is a point where you become too frugal. That was too frugal. I make enough for us to be stable and save. There is no reason to be “cheap” and not skimp on some things. But through couponing, I also open up opportunities within our budget that didn’t used to be there before. Couponing is not easy. Couponing is not always fun. You do not always get the deals that are advertised. You do not always get the right coupons in the newspaper. But, it can be well worth it. You have to think about your time. I work full time and feel that I put my heart and soul into my job. I want and need to spend time with my kids. But I also like to provide for them. So, we try to make it a family ordeal. Arianna loves to help me carry products around the stores. Evan likes to just hang out and ride in the cart or be in his Moby while we walk around. Greg and I get walks in. And at the end of the day, we return home with bags of goodies, most of them on the free and cheap. It really brings a smile to my face. 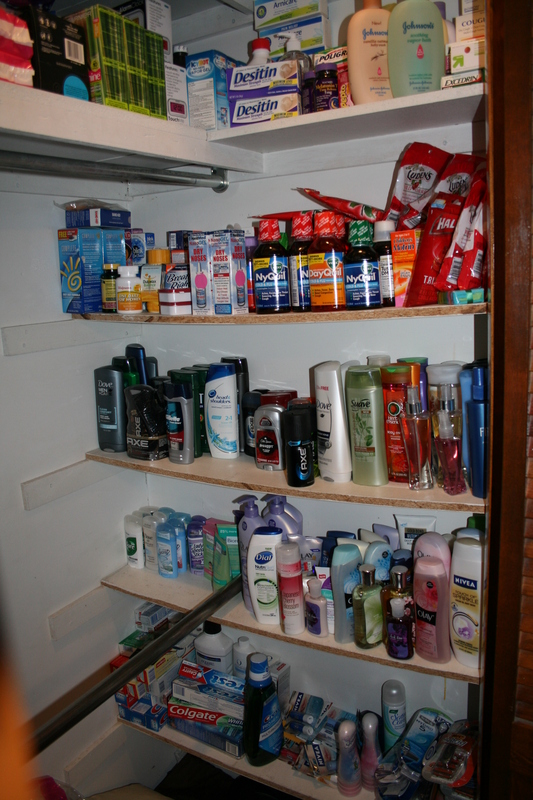 You look at that closet up there and think, wow, they are hogging all the good products! Let me tell you that it is really nice to have all this on hand when guests come (think welcome baskets, extra products that you don’t mind sharing). It’s nice to try different products out to know what you’d be willing to actually pay for. It’s nice to know that if you hear someone needs to run to the store for something, you can just say, hey, I have that. We do realize that there are expiration dates on some of the products, so we do realize we will get a chance to make donations too. Right now, I am saving up that toothpaste for health kits for my dad’s church. Every week, the “store” grows. But once you stop going every week, you wouldn’t believe how quickly it goes down. Since my maternity leave, I have put most of my energy into grocery couponing and picking up a few freebies here and there. This way, the store doesn’t get out of control, but I can keep “rolling” my deals. What are some of the best specials we’ve got couponing? Free diapers. Free cold medicine. Free kids’ aspirin. These are the things that go fastest in our house–and how great is it that the rest of the products help us get them for free?!?!?! This entry was posted in Weekends. Bookmark the permalink. It is a great addiction!